Kristianti, Fanny (2001) Pengaruh kurangnya komunikasi ibu sebagai orangtua tunggal terhadap remaja laki-laki pengguna narkoba dan perilaku seks pranikah di Mangga Besar. Skripsi thesis, Universitas Tarumanagara. "Parental divorce causes varieties of problems. Father may leave the house and mother must take all over the responsibilities to take care the children. Fatherts absence causes the male adolescences unable to have identity figure. Single mother's tight schedule causes the communication between mother and children become scarce. As a result, the adolescences tend to seek out activity and entertainment along with their peers and often time they experiment with drugs and conduct sexual activities such as in Mangga Besar area. This research use interview to obtain the data. Participants were four adolescences, each was raised by a single mother, had been living in Mangga Besar area, considered as drug addicts and having sexual promiscuity. This research utilized Hurlock's theory as the basic concept of development. 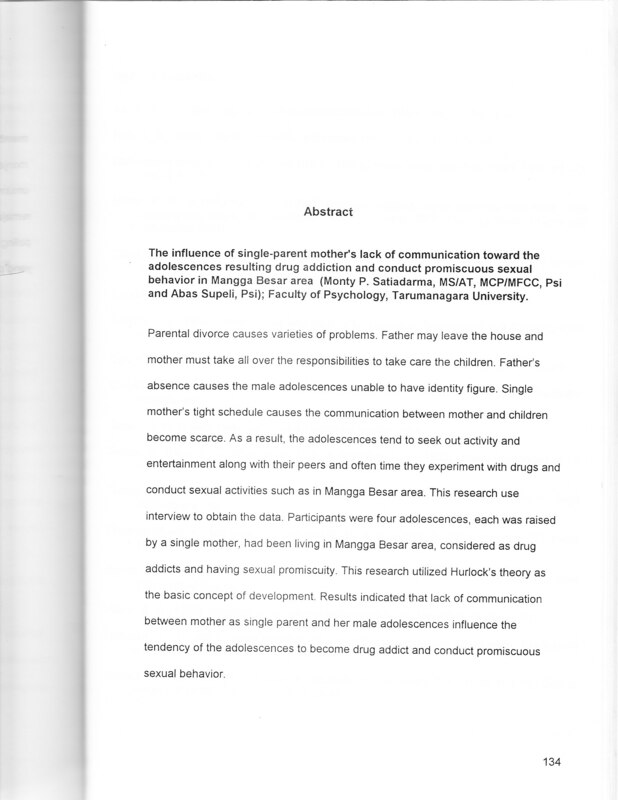 Results indicated that lack of communication between mother as single parent and her male adolescences influence the tendency of the adolescences to become drug addict and conduct promiscuous sexual behavior."